Hosts who know make recipes like these. 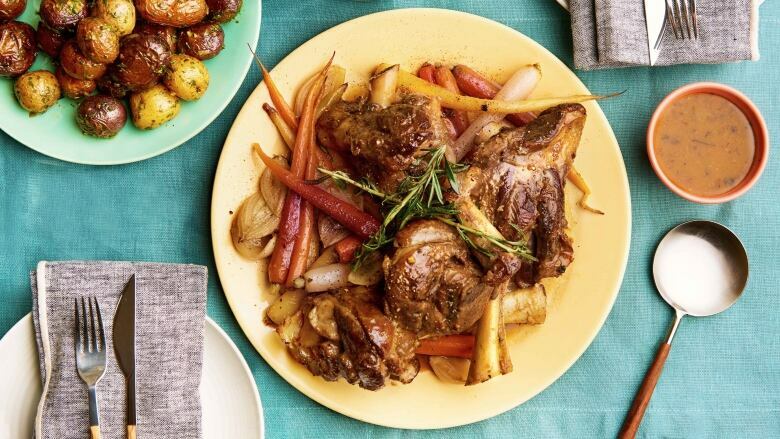 If you’re looking for a meaty main to serve guests (these lamb shanks would fit into an Easter or spring menu nicely), this recipe checks off a lot of boxes. Ease? Check — nothing complicated here and the lamb marinates overnight so the work is split up. Delicious? See: ‘lamb marinates overnight’ mmm…. Lets you hang with guests instead of panicking in the kitchen? Aside from reducing the braising liquid at the end, this gorgeous thing mostly cooks itself. Did we mention it’s a one-pot wonder? Recipe search over, right? First, marinate the lamb shanks. In a medium bowl combine the olive oil, mustard, salt, black pepper and grated garlic. Rub the marinade into the lamb shanks, cover and leave in the refrigerator overnight. Prepare your bouquet garni by wrapping the sage, rosemary and thyme in the cheesecloth. Heat ¼ cup olive oil in a large heavy-bottom, dutch oven or other oven-safe pot. Working in batches, brown the outside of the lamb shanks – approximately 2-3 minutes on each side. Remove the lamb shanks from the pot and clean out the bottom. Add ¼ cup olive oil to the pot and return it to the heat. Once the oil is shimmering, add the shallots, garlic and carrots and sauté for 3-5 minutes. Add the mustard, and season with salt and pepper to taste. Add the vinegar to deglaze the pan, allowing it to simmer for 1 minute, then adding the cider and chicken stock. Submerge the bouquet garni in the braising liquid, return the lamb shanks to the pot ensuring they are mostly submerged. Cover and transfer to the oven to cook for 3 hours. Check on the lamb every hour, to turn them and ensure even cooking; remove the lid for the final hour of braising. Once done, transfer the pot to the stovetop and carefully remove the lamb shanks, carrots, shallots and bouquet garni onto a platter. Turn the heat up to high and reduce the braising liquid until you have approximately 1 cup of jus remaining. Turn the heat down to low and return the lamb shanks to the pot to reheat and soak in the cider-mustard jus. Transfer lamb shanks to the platter of carrots and shallots and drizzle jus over the shanks. Serve with any remaining jus on the side.